Neck anatomy is a well-engineered structure of bones, nerves, muscles, ligaments and tendons. The cervical spine (neck) is delicate—housing the spinal cord that sends messages from the brain to control all aspects of the body—while also strong and flexible, allowing movement in all directions. The neck begins at the base of the skull and through a series of seven vertebral segments connects to the thoracic spine (the upper back). With its complex and intricate construct, and the many stresses and forces that can be placed on it through a trauma or even just daily activities, the cervical spine is at risk for developing a number of painful conditions. The cervical spine is comprised of seven vertebrae: C1, C2, C3, C4, C5, C6, and C7. These vertebrae begin at the base of the skull and extend down to the thoracic spine. The cervical vertebrae have cylindrical bones that lie in front of the spinal cord and stack up one on top of the other to make one continuous column of bones in the neck.At each level, the vertebrae protect their segment of the spinal cord and work with muscles, tendons, ligaments, and joints to provide a combination of support, structure, and flexibility to the neck. Each vertebra has a pair of facet joints, also known as Zygapophysial joints, or Z joints for short. 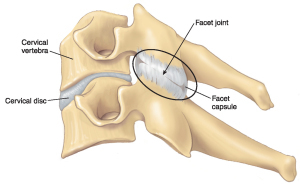 These joints are lined with smooth cartilage to enable limited movement between two vertebrae. The small ranges of motion between the two vertebrae can add up to significant ranges of motion for the entire cervical spine in terms of rotation, forward/backward, and side bending. 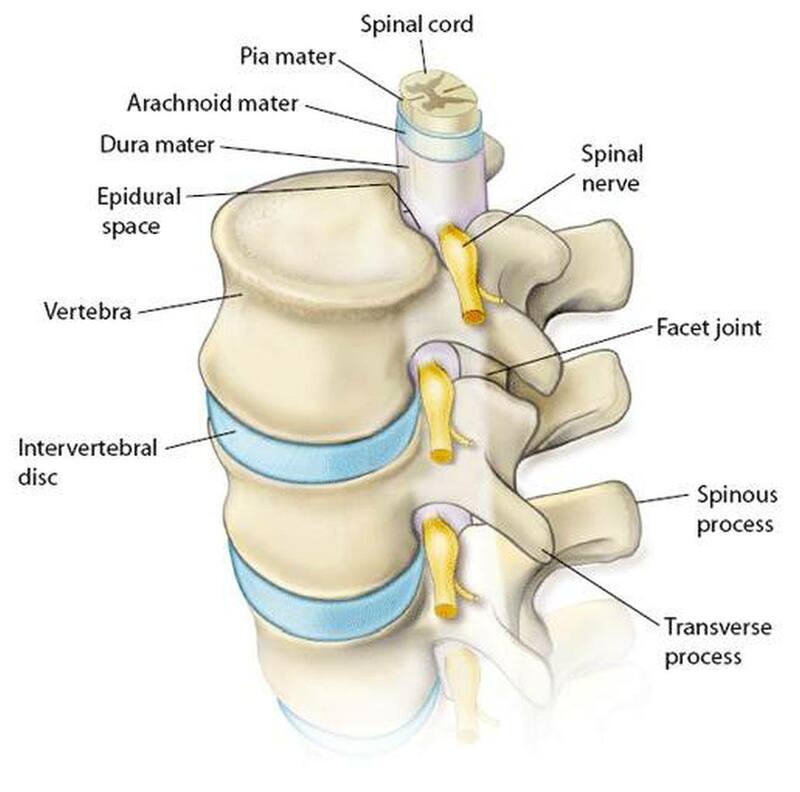 There are 23 total discs in the entire spinal column, and 6 of them are in the cervical spine. Each cervical disc rests between the cervical vertebrae, acts as a shock absorber in the cervical spine, and enables the neck to handle various stresses and loads. In addition to the seven cervical vertebrae, cervical anatomy features eight cervical nerve roots (C1-C8) that branch from the spinal cord and control motor and sensory abilities for different parts of the body. Each level of the cervical spine actually has two nerve roots—one on each side—that branch off from the spinal cord. Houses and protects the spinal cord. A bundle of nerves that extends from the brain and runs through the cervical spine and thoracic spine (upper and middle back) prior to ending just before the lumbar spine (lower back), the spinal cord relays messages from the brain to the rest of the body. Supports the head and its movement. In addition to supporting the head, the cervical spine allows for the head’s flexibility, including rotational, forward/back and side bending motions. Neck pain typically resolves in days to weeks but can recur and become chronic (long lasting). If you have a previous history of neck pain you are more likely to suffer from neck pain in the future. If you are over 40 years, you are also more likely to suffer from repeated episodes. Neck pain that involves injury to the joints and muscles typically resolves more quickly than neck pain involving the discs and nerves. Cervical facet irritation occurs as a result of irritation or injury of the joints in the cervical spine (neck). Causes of cervical facet injury include: whiplash injuries, blows to the head or falls. Cervical facet irritation can also occur from mundane activities such as improper sleeping position, working out, shoulder checking, etc. Diffuse non-specific neck pain at the back of the neck. Neck pain may be described as pinching, sharp or catching with neck movements. Pain is aggravated by movements (especially neck rotation and or tipping the head backwards). Cervical degenerative joint disease can be defined as a breakdown of the cervical spine facet joint surfaces with a loss of cartilage. This can occur in combination with degenerative disc disease, which occurs when there is a loss of disc height. The breakdown of cartilage leads to inflammatory cascade that can lead to bone spurs. It’s the result of daily wear and tear in combination with injuries sustained throughout life. The wearing down of cartilage leads to an inflammatory response in which thickening, bone spurs and narrowing of the joint spaces occur. These changes do not occur due to one single injury but occur over time. Mild degenerative changes may be seen on x-ray in those over the age of 30 but typically moderate to severe degeneration (arthritis) is not seen until at least 40-50 years old. Though degenerative changes in the spine can cause inflammation and pain it is unknown the exact role that degeneration plays in the development of pain. For example, most people over the age of 50 have some signs of arthritis in various regions of their spine but may not have pain. Additionally, people with mild arthritis may have more pain than those with severe arthritis. If you have degenerative changes in your spine it’s important to remember that this may only be a part of why you are in pain. Oftentimes cervical facet irritation, muscle tension and other structures can cause pain that occurs concurrently with degeneration in the spine. Cervical disc herniation occurs when one of the discs in the neck bulges or herniates outwards causing localized neck pain and or nerve irritation. It rarely occurs due to direct trauma and is often a slow, progressive process that occurs over periods of time. Small tears in the disc occur over time with repetitive movements and activities and eventually the disc bulges outwards, which can create disc pain and or nerve root irritation. 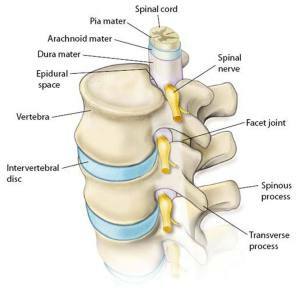 Cervical disc herniation’s are most common in invidious under the age of 40 years old. Cervical muscle strain is a soft tissue injury to the muscles of the cervical spine. The mechanism of injury is usually a fall, motor vehicle accident, or blow to the head. A cervical radiculopathy occurs when one or more of the spinal nerve roots are irritated or injured. 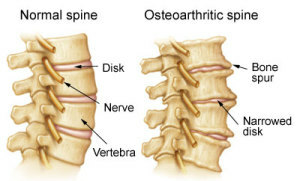 This is typically due to degenerative changes found in the spine (arthritis) or an injury that causes inflammation around the nerve (motor vehicle accident, disc herniation). In the population younger than 40 years old cervical radiculopathy is typically due to a disc herniation or an acute injury. In the older population it is more likely that cervical radiculopathy is due to nerve root irritation/impingement due to arthritis in the neck that narrows the space where the nerves exit the spine. Neck injuries that may cause cervical radiculopathy include: whiplash injuries (hyperextension) or compression injuries. Numbness and or tingling in the arm or hand. Pain in the neck, between the shoulder blades, upper shoulder or arm/hand. Limited neck range of motion. Sensation changes along the course, which that nerve root courses. At Mountain Health & Performance we will conduct a thorough history and physical examination to properly diagnose your neck pain. After a diagnosis we will create a plan of management that may involve the above treatments which are most appropriate for you. Some studies have found that specific types of yoga such as Iyengar (alignment based) yoga were effective in reducing chronic neck pain vs. an at home exercise program. Iyengar yoga has also been shown to be an effective means for back and neck pain in the short-term. Yoga is typically well tolerated and may provide additional positive effects on psychological well-being and quality of life. It should be noted that Iyengar yoga is a specific type of yoga that uses supportive props and sequences of postures that are specifically tailored to each individual, taking into account their injuries and pain. For this reason one-on-one yoga practice and or therapy will likely be a more effective means of utilizing yoga for the treatment of neck pain. The poses, stretches and strengthening components of the yoga session should be tailored to address each individual persons level of ability, dysfunctions, limitations and goals. Please call the clinic at 604-984-0014 if you are interested in private yoga therapy sessions with Dr. Amy Wiggins. Dr. Amy is trained in 200 hour Hatha Yoga and in addition to her Kinesiolgy and chiropractic degrees has taken many additional courses in rehabilitation and manual therapy. The right pillow is important to keep the neck supported and in alignment during sleep. Without proper support the neck can be stressed which may worsen symptoms of a preexisting neck injury/condition and or can create stiffness or tension that was not there prior. There are no one-size fits all pillows for each person. Each person’s spinal anatomy may be different so it’s important to test out pillows and follow these guidelines when choosing a pillow. When laying on your side your head, neck and spine should be in alignment. If your pillow is too flat your head and neck will tilt down, while if the pillow is too bulky your head and neck will tilt upwards from your spine. When lying on your back you want to make sure you have a similar alignment between your neck/ head and rest of the body. Think of drawing an imaginary straight line from the top of your breastbone to the shoulder and ears. At Mountain Health & Performance we sell Chiroflow water Pillows because they can be adjusted to head movement, which provides neck support while you sleep. This pillow is a great option because the firmness will be determined based on the amount of water you fill the pillow with. If it feels too firm you can remove some water. Adding and removing a little bit of water at a time can help you to find the perfect pillow for your neck and spine. It’s a completely customizable pillow for you!